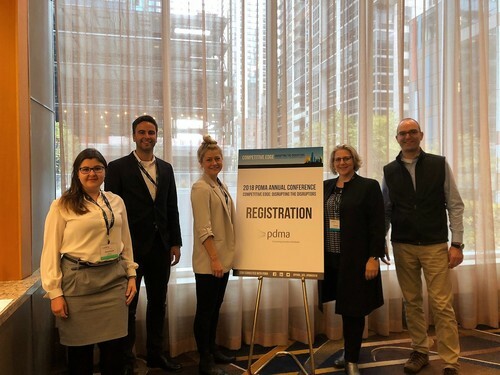 The team attended the 2018 JPIM Research Forum powered by Product Development and Management Association (PDMA) in Chicago (Illinois) from the 3rd to 4th November 2018. The JPIM Research Forum is a major innovation management conference. Mrs. Welzenbach (Being a Good Corporate Citizen while Maximizing Innovation Performance: A Conceptual Integration of Customer Co-Development and Responsible Innovation) and Mr. Holfeld (Data Sponsorship: Understanding and Leveraging the Mechanism to Spark Innovation ) contributed to the Poster Session. Furthermore, Prof. Spanjol spoke about her goals for JPIM as the Co-editor. Together with our colleagues from the Institute for Leadership and Organization (ILO) we celebrated the best student paper (Anastasia Grass) and poster award (Christopher Holfeld).